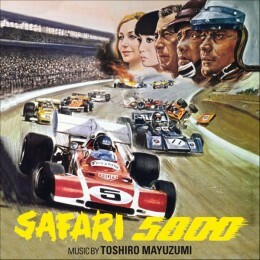 Toshiro Mayuzumi's score for the car-racing movie Safari 5000 is the 371st Soundtrack of the Week. The main theme, which apparently tracks with Yujiro Ishihara's character, is heard in various arrangements, as straight-up dramatic score, as a vocal number, a piano number, a Latin number and so on. The rest of the album does not disappoint, particularly the "Shake" that Mayuzumi wrote. Thanks to Quartet Records for releasing this gem!